The genus of Hydrangea is indeed diverse and comes in a wide array of forms, from small scrambling shrubs to 2.5′ (Hydrangea scandens of Japan), dramatic trees to 35′ (Hydrangea xanthoneura of China) and impressive evergreen vines that will, in our climate, easily climb to 100′ or more (Hydrangea seemanii of SW Mexico). We are particularly fortunate in the Pacific Northwest to have the opportunity to grow an enormous number of Hydrangeas as well as other genera included in the ranks of the Hydrangea Family. Although many people have in their gardens the common climbing Hydrangea, H. anomala var. petiolaris, far too few cultivate two other closely allied genera that are worthy components of the late summer garden. Both will be in full adornment in early September long after their climbing Hydrangea counterparts are finished. The foliage of Schizophragma hydrangeoides (indeed the specific epithet refers to its similarity to Hydrangea) can appear to the untrained eye as identical to that of Hydrangea anomala. Even its flowers may initially fool the trained horticulturist! Closer examination will illuminate the fact that the ‘stuff’ of ornament of a Schizophragma blossom are large tear-shaped sepals that encircle a flattened inflorescence. Though true Hydrangeas instead employ 3-5 smaller sepals to achieve a similar effect, both genera accomplish the same goal; attracting pollinators to the flowers. Interestingly (or at least I thought so as I wrote this piece late at night), the above-pictured Schizophragma hydrangeoides in our woodland at Heronswood was collected by seed on Ulleong Island in the Japanese Sea from a plant that was entirely intertwined with Hydrangea anomala var. petiolaris. This attests to the fact that both thrive in precisely the same conditions, in nature as well as in the garden. 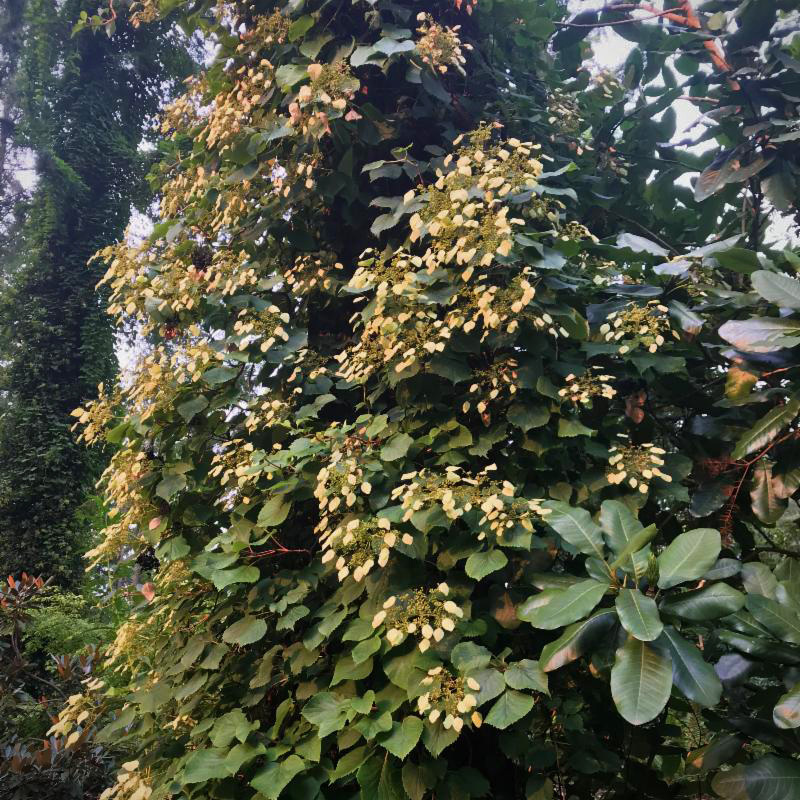 The honey-scented flowers of Pileostegia viburnoides open dependably during the last days of August. 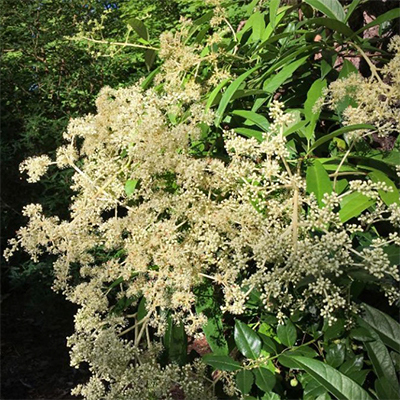 Blossoming concurrently in our woodland is a close relative of Schizophragma (some taxonomists will argue that it IS a Schizophragma) though infrequently, if ever, muddled with Hydrangea. I collected the seed of our Pileostegia viburnoides in Taiwan though have encountered it frequently throughout northern Vietnam. It is a beautiful evergreen, self-clinging vine possessing narrow and glossy leaves to 5″ in length. In late summer, frilly cymes of heavily-scented flowers erupt amidst its foliage, filling the air of our woodland drive with a delicious aroma of honey. Not surprisingly, honey bees are highly attracted to the flowers that rely entirely on scent- not show- to get the business of pollination underway. As admittedly worthy these two vines are in stopping to admire (and smell) during your next visit to Heronswood, they represent only a fraction of the beginnings of the glorious autumn season in our garden. We look forward to hopefully seeing you here this Friday or Saturday.